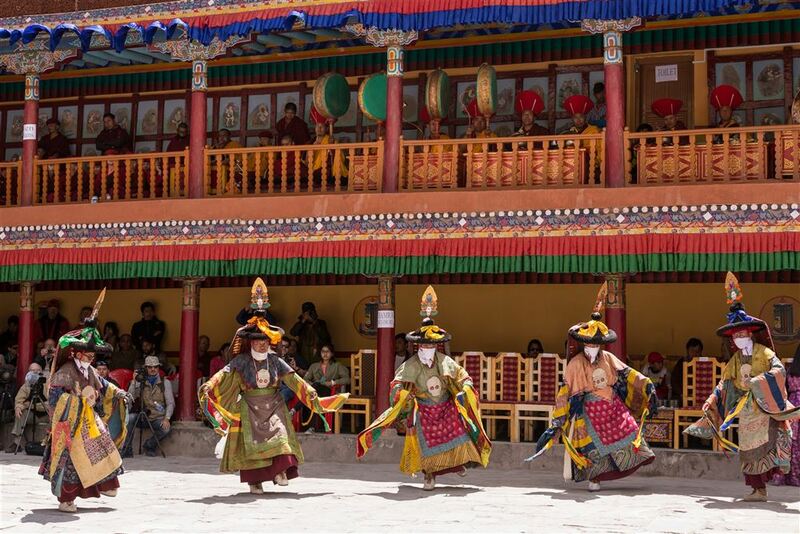 According to the Tibetan calendar, the great annual festivals held in the villages of Ladakh takes place in winter, with the exception of thseshu held at Hemis in summer. 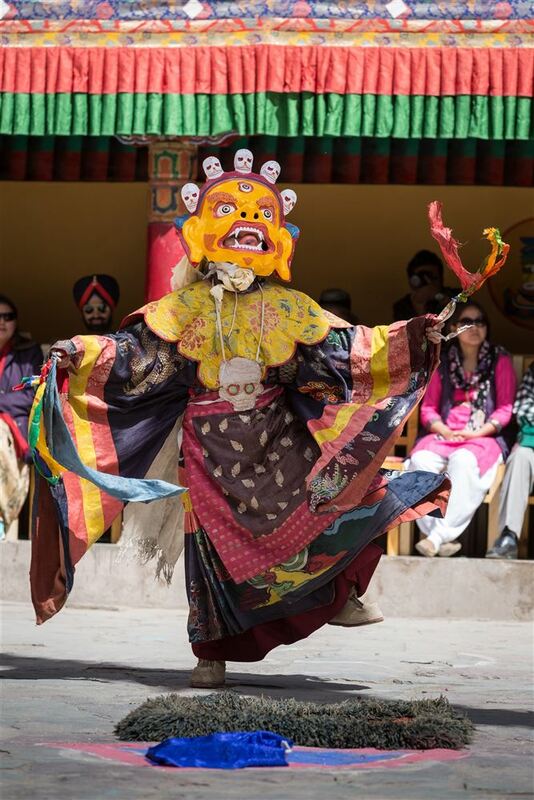 This is one of the most important events of the valley, its chief feature being the presentation of a mask dance-drama for two days. 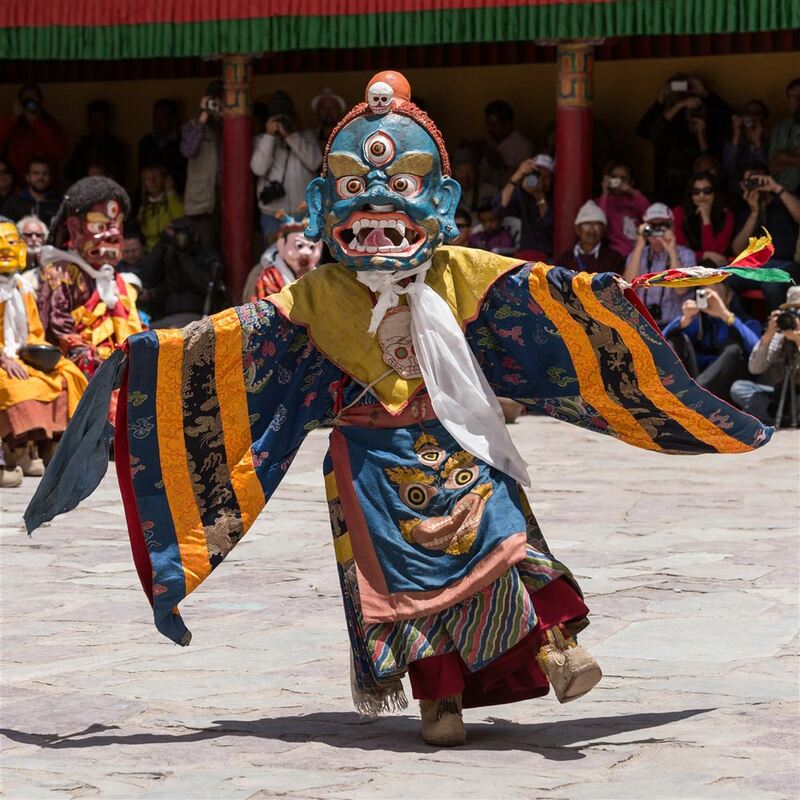 From the time of Rgyalsras Rinpoche around the year 1730, the Hemis Festival has been observed year after year without a break and has now become well known the world over. 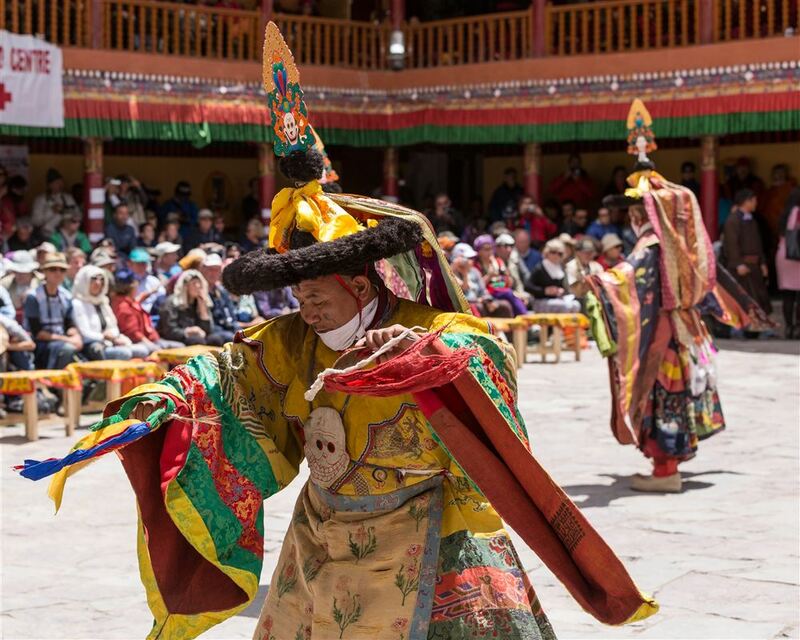 The festival commemorates the birthday of Guru Padmasambhava, the celebrated founder of the Lama tradition and the presiding authority of Tibetan Buddhism. 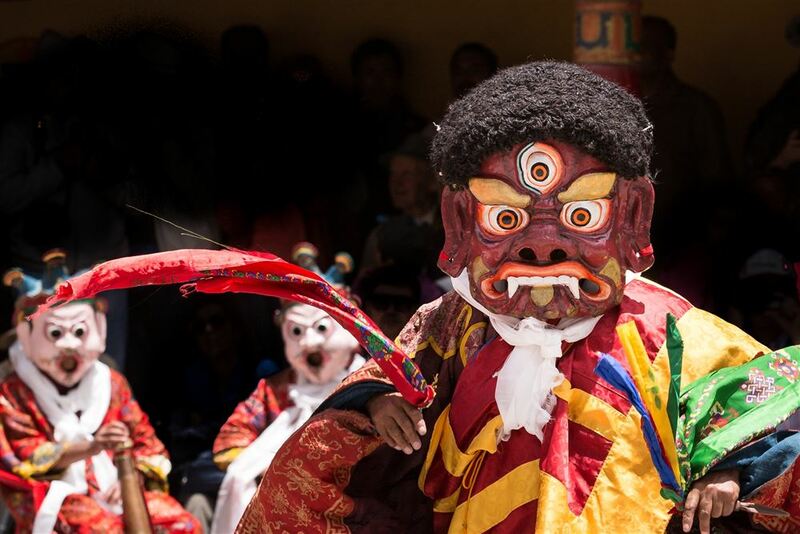 According to the records in Sikkim, Padmasambhava came northward and convinced the Lamas of Tibet that he was sent to Tibet as an incarnation of Buddha. 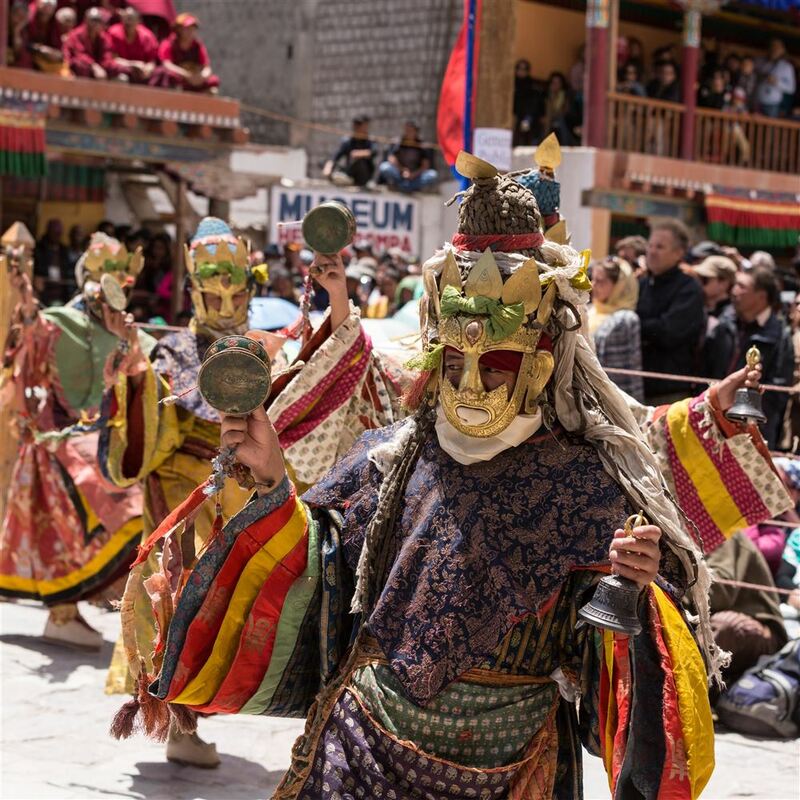 The festival both eulogises the great deeds of Padmasambhava and reiterates the victory over evil for the protection of Buddha dharma. 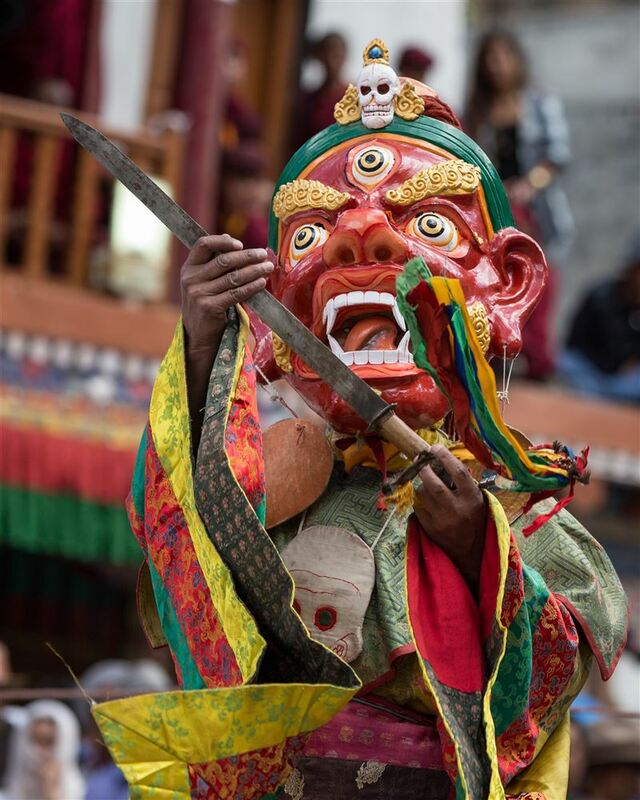 Guru Padmasambhava is the founder of the Tibetan tradition and the source of the Terma tradition of the nyingma. 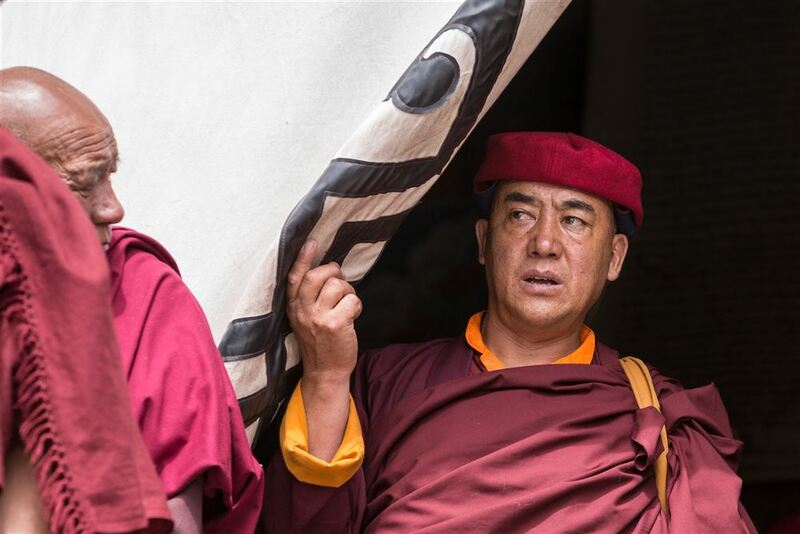 He is popularly known as Rinpoche, the precious teacher. Nyingmas honour him next to Buddha and refer to him as the second Buddha. 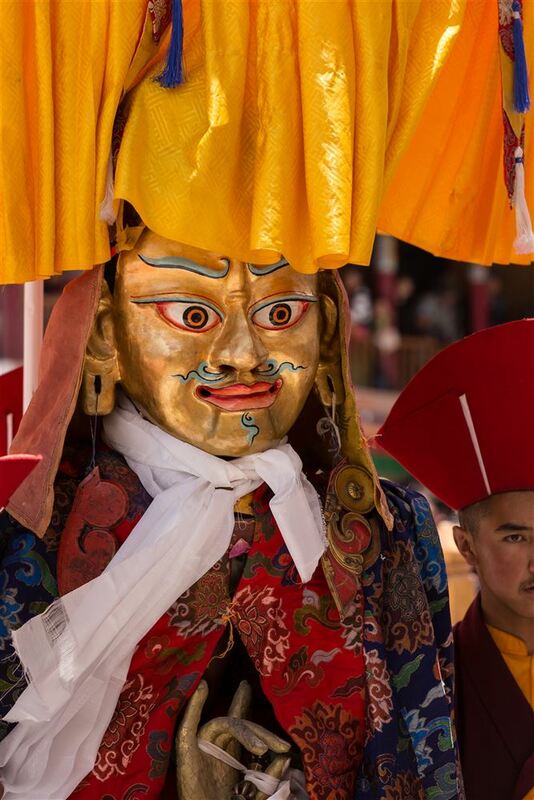 It is believed that guru Padmasambhava descends as a representative incarnate of all the Buddhas, to bestow grace and improve the conditions of living. 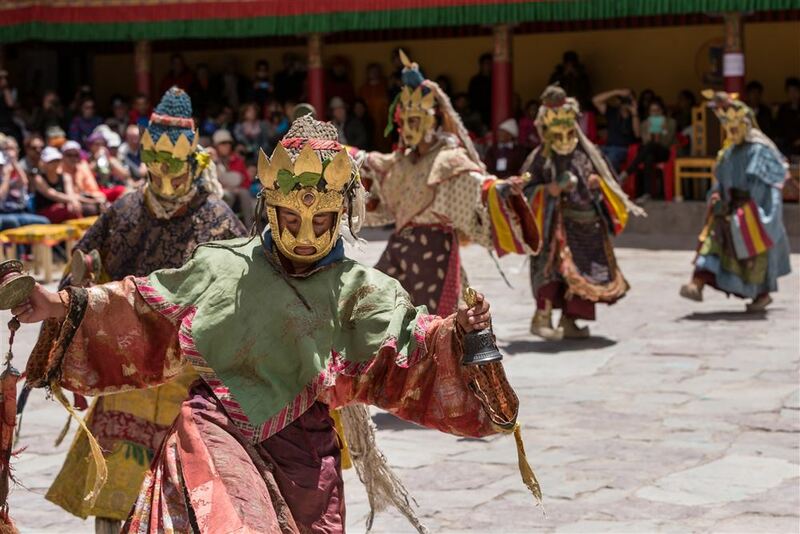 The purpose of this sacred performance and the dances is to bestow good health, subjugate disease and conquer evil spirits. Guru Padmasambhava is regarded as one of the most extraordinary teachers in the history of Buddhist sages, a possessor of enlightened power. He was a great esoteric practitioner, said to have been born in a lotus, led an ascetic life and taught numerous followers about the esoteric approach to enlightenment and had the distinction of assuming different forms at different places. Anyone attending the two day festival and wanting to find out more about the dances themselves will struggle to find any solid information. 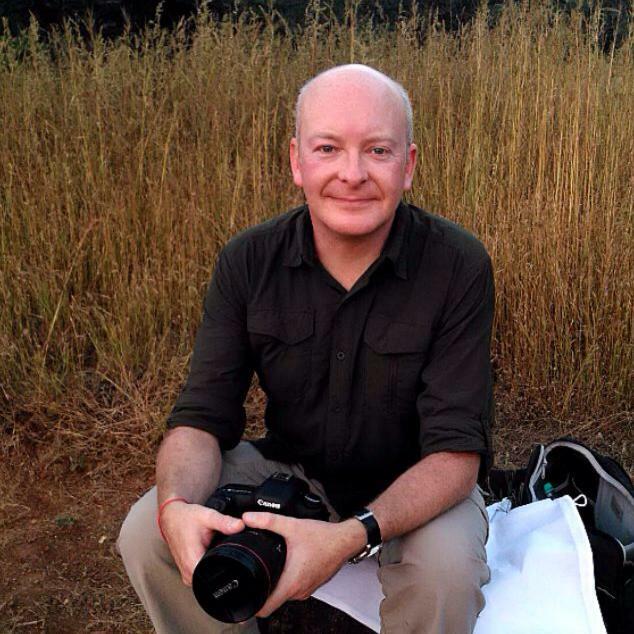 What follows is my attempt to link the photography to the dances, with some explanation as to what is going on. 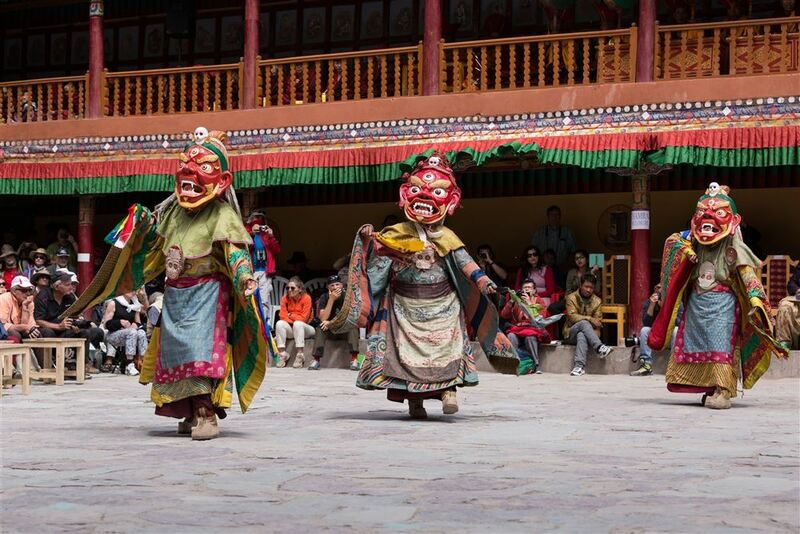 The Hemis festival takes place in the rectangular courtyard in front of the main door of the monastery. The space is wide and open save two raised square platforms, three feet high with a sacred pole in the centre. The platforms mark out the centre of the performance space, in front of the main door to the monastery. 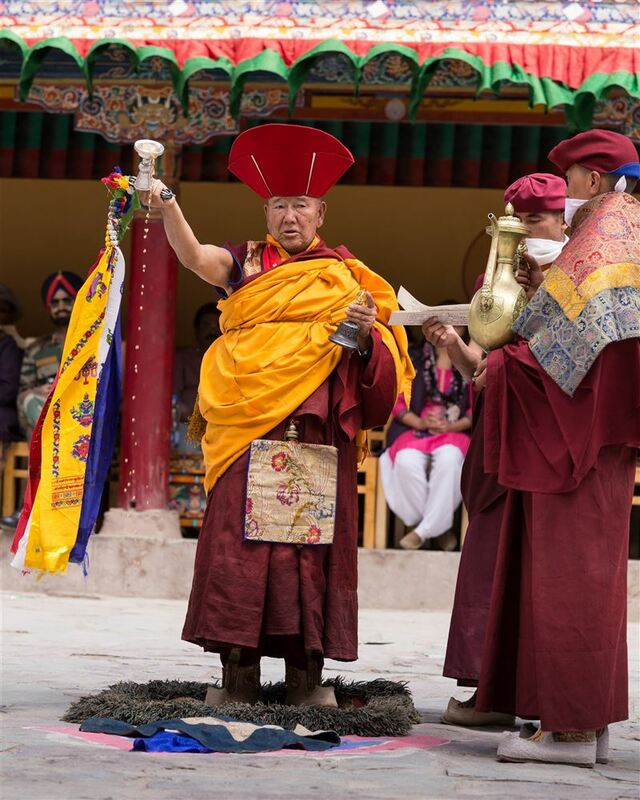 A raised dias with a richly cushioned seat with a finely painted small Tibetan table is placed with the ceremonial items – cups full of holy water, uncooked rice, tormas made of dough and butter and incence sticks. A number of musicians play the traditional music with four pairs of cymbals, large-pan drums, small trumpets and large size wind instruments. 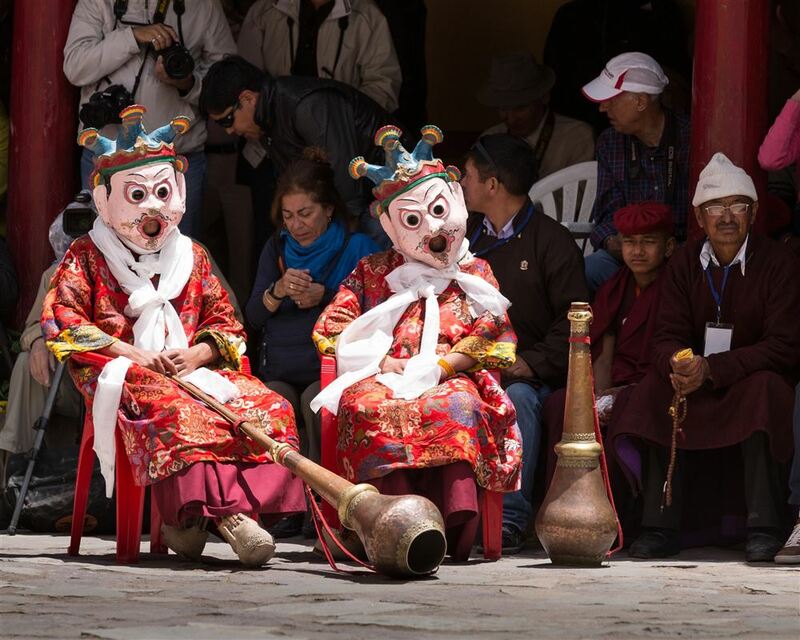 Next to them, a small space is assigned for the lamas to sit. Prior to arriving on the first day of the two day festival I was unable to determine when exactly the performances would commence. Nobody in Leh was even able to offer any advice beyond the obvious comment that I should get there “early”. I arrived at 8am, the performances started at 10:30am. This was in fact for me the perfect time to arrive, it gave me plenty of time to determine where I should stand/sit, and the whole build up to the event is well worth observing, with monks from other monasteries, locals and tourists arriving with the anticipation increasing as to what was going to unfold during the day. 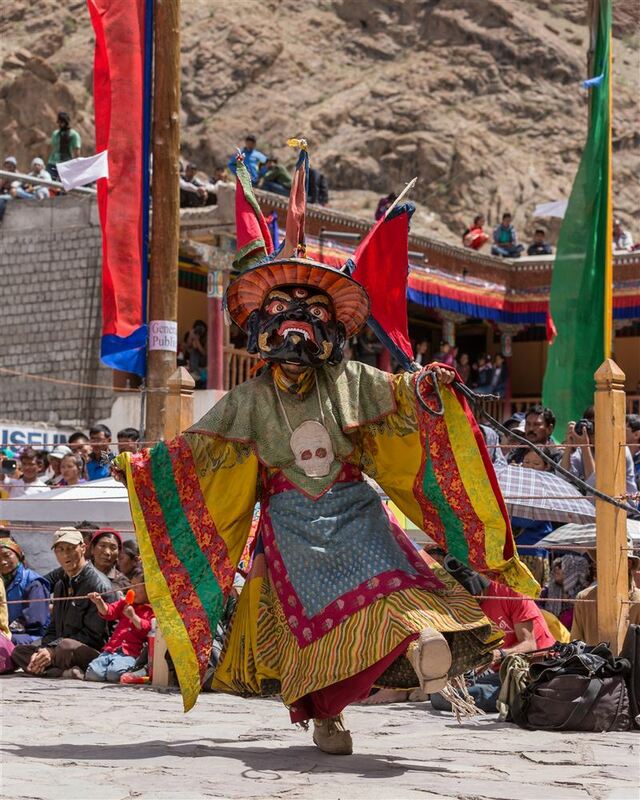 The Mask Dances of Ladakh are referred collectively as chams Performance. 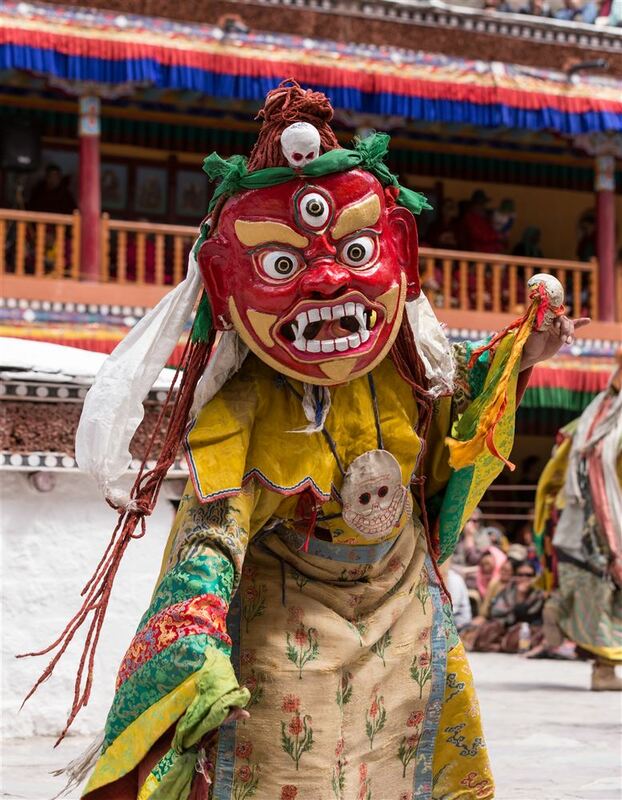 Chams performance is essentially a part of Tantric tradition, performed only in those gompas which follow the Tantric vajrayana teachings and the monks perform tantric worship. The chams are performed in strict adherence to the prescribed texts orally transmitted, from generation to generation. 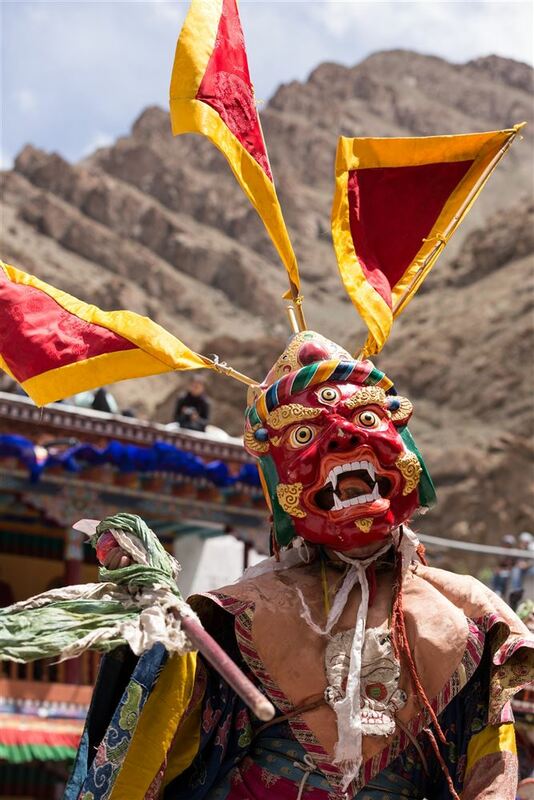 Chams are performed with masks, and costumes of various meditative and protective deities. 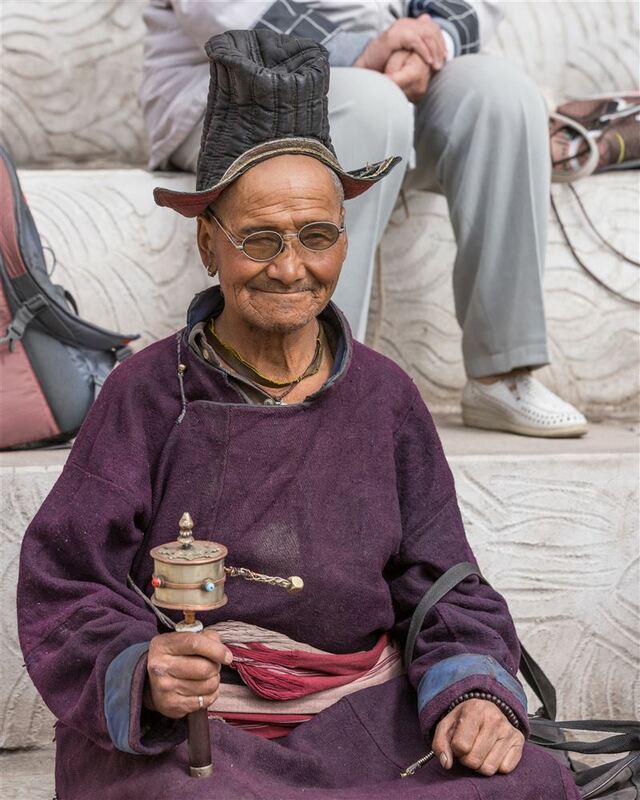 Each monk assumes the personage and personality of the deity he is meant to characterize. 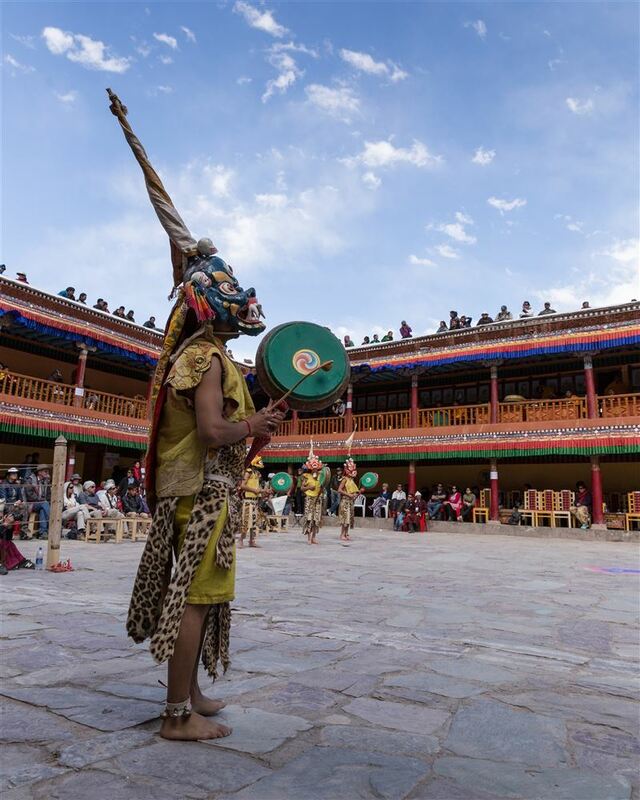 They then come out into the open courtyard and dance around the central pole with slow and solemn movements of legs and hands to the special music of drums, cymbals and wind-instruments. 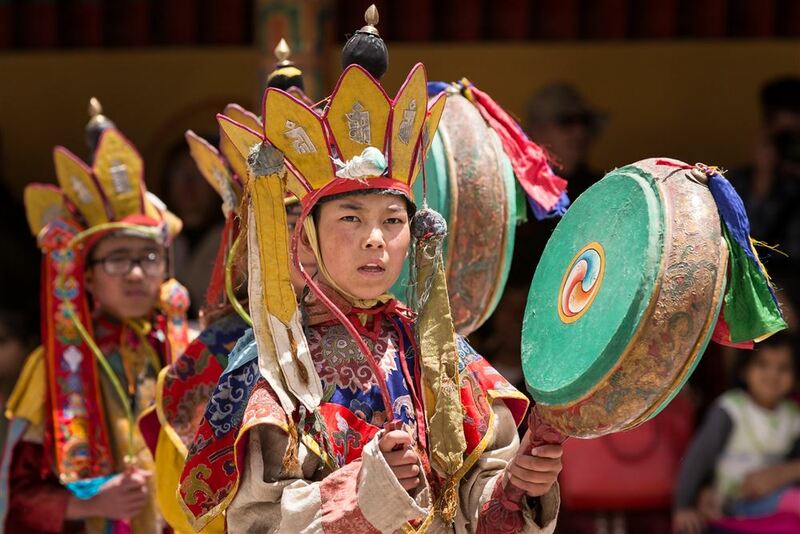 Tibetan ritual music played during chams performance contains a variety of protean forms. 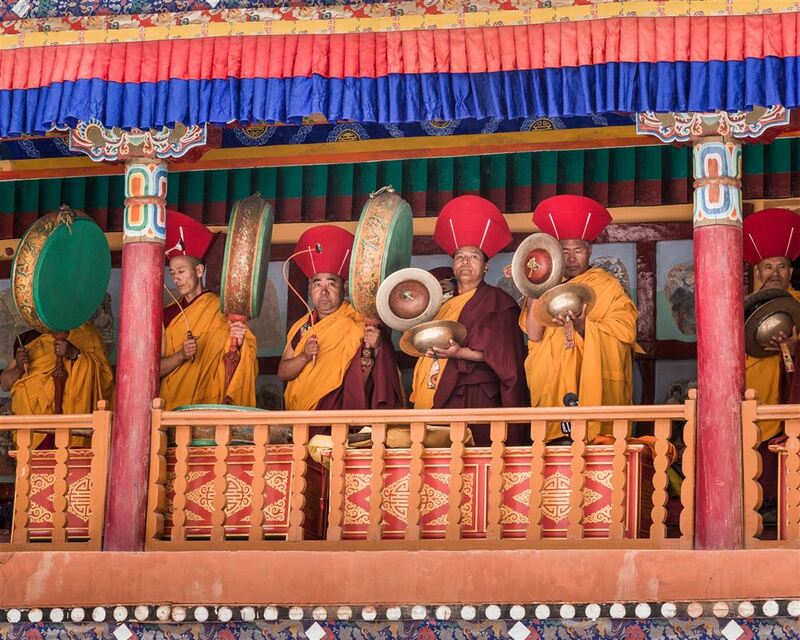 Tibetans believe that religious music has its origin in the teachings of the dakinis. 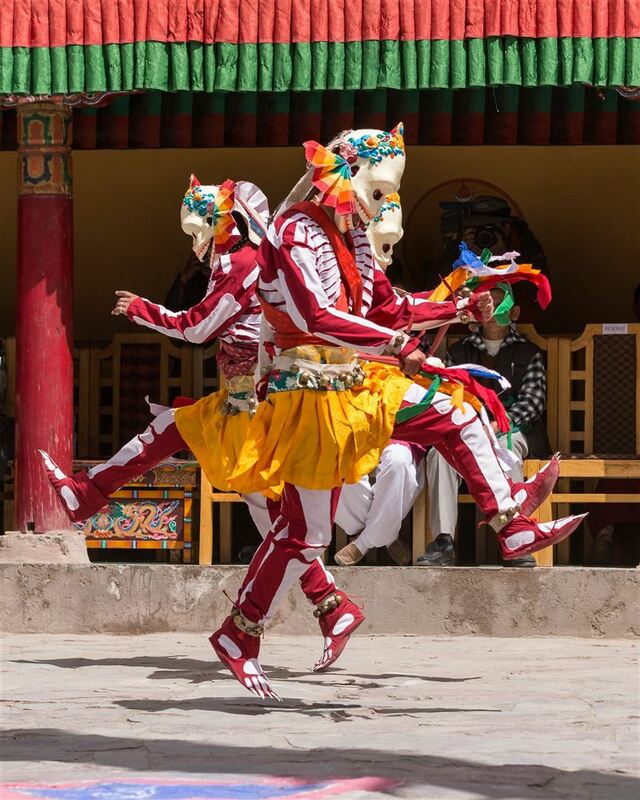 Legend also holds that a lama named Takpo Dorjechang (1543-1588), transmitted the most complex and beautiful music the yang (olbyangs) through dakinis. 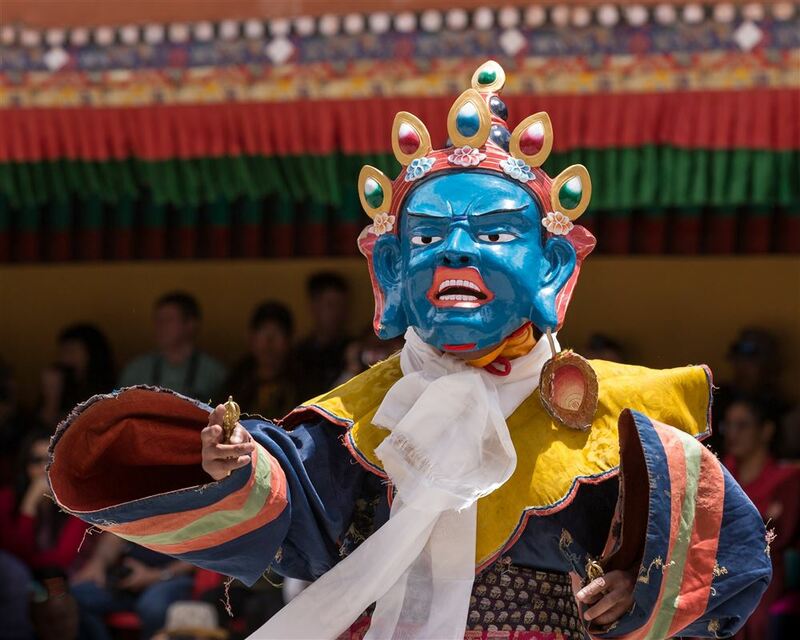 Within the ritual context, the main function of music as described by Chogyam Trungpa Rinpochey, is to act as an accompaniment to the general psychological process of the rite. Music is looked upon as a sacred offering to the deities. Aurally beautiful, it enhances the dance-drama by sustaining and lending the whole performance an orderly rhythmic element. 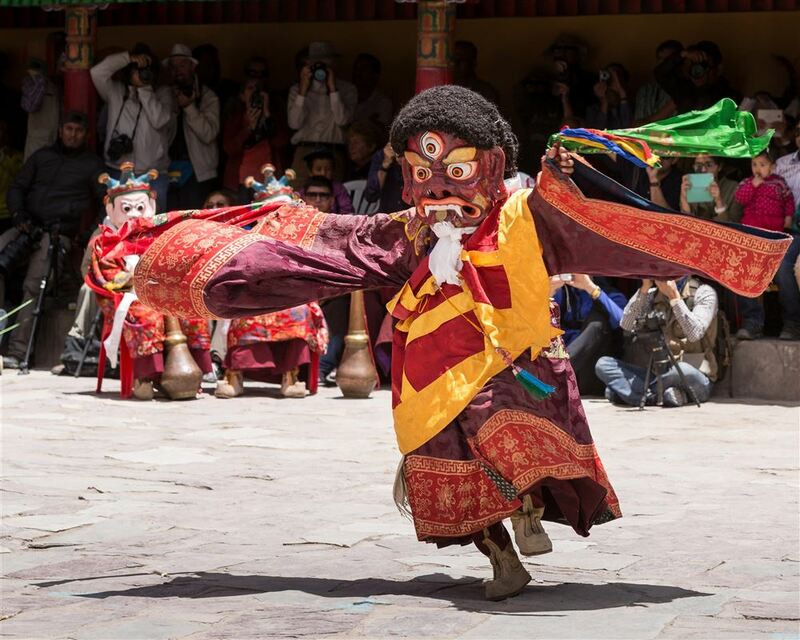 The music that is played in monasteries is often categorized in terms of the deity to whom the offerings are made. 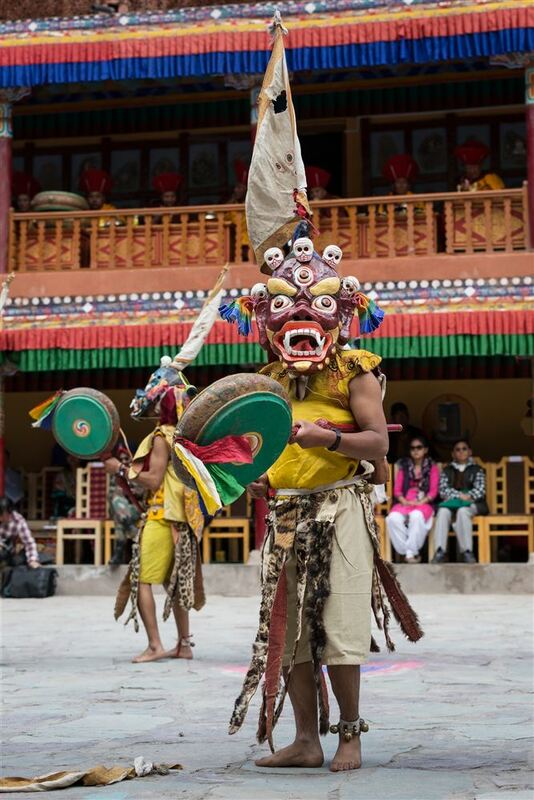 The musical offerings are often suited to express the nature of the deity. After the preliminary preparations, the show gains momentum. Thirteen dancers with large black hats with wide round rims enter the scene. From the back of these hats coloured ribbons stream down. Their robes are heavy and made of rich Chinese silk with brocade. 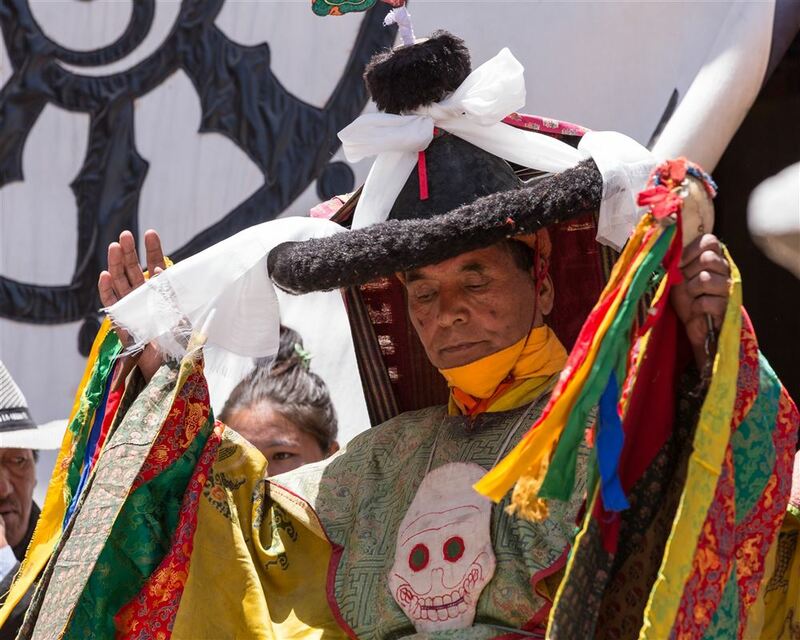 They wear rich capes and aprons and a necklace with a skull emblem, which is a potent symbol to remind the viewers of the impermanence and brevity of life. They slowly dance their way round the courtyard, clock wise. 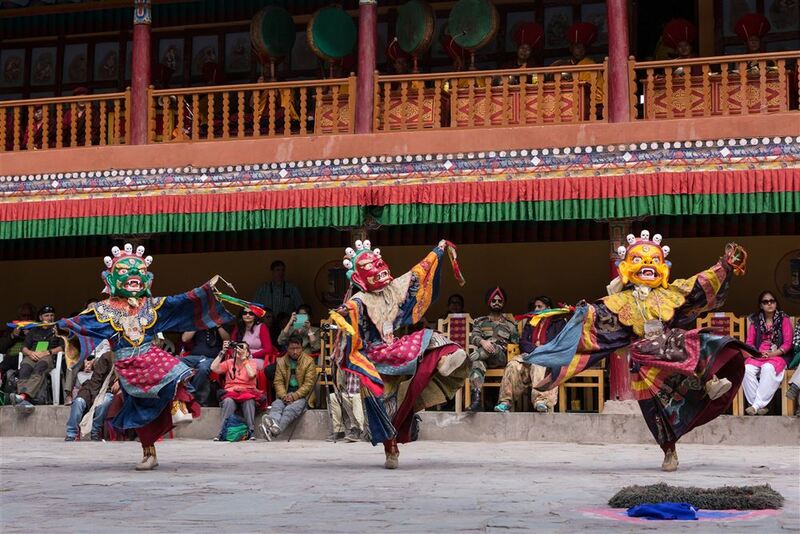 Each dancer is given a few sprigs of dried sacred herb by a lama, and then they slowly make their way to the exit. 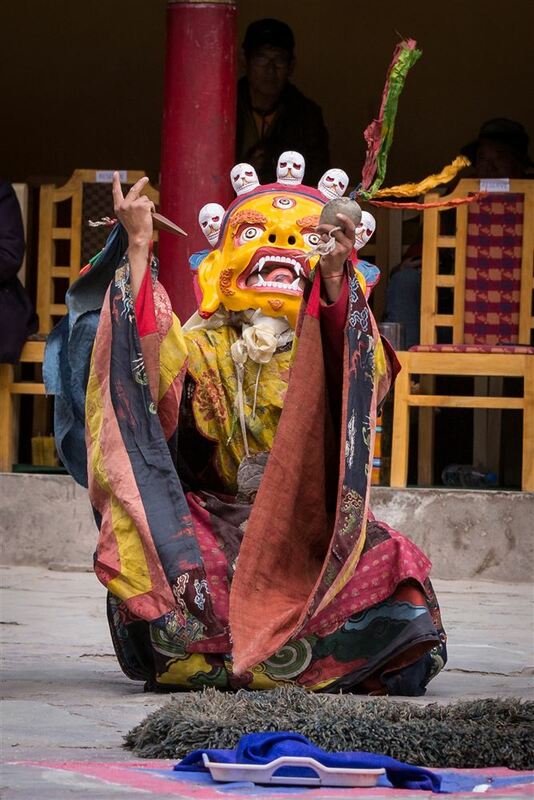 The purpose of this tantric dance is to dispel evil forces and mark out the exterior limits of the performance space and ‘bind’ the quaters by their sacred movements. 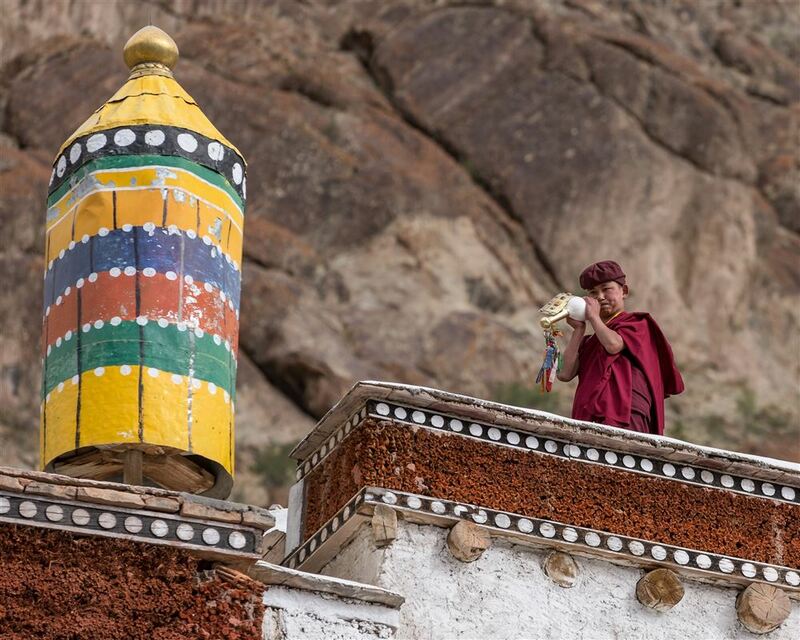 The number thirteen is identified with the thirteen yugas of the Cosmos and thirteen rings of the chorten. 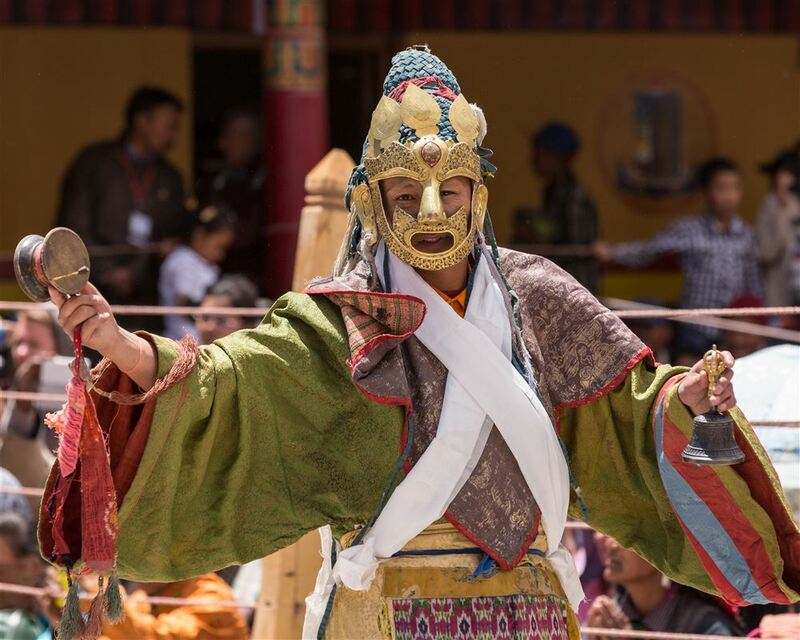 Sixteen males dressed as compassionate dakinis with metal masks enter the arena of the performance. Each of these dakinis hold a damaru and a bell in their hands. 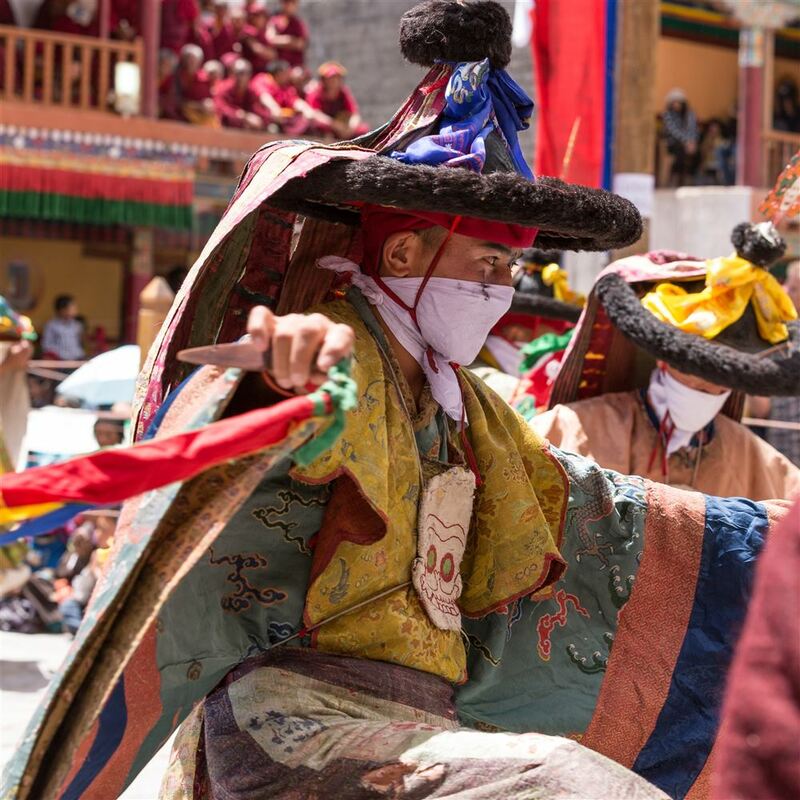 They dance in slow steps around the sacred pole to the chant of cymbals and drums chanting in a low melodious voice the mantra of Padmasambhava :Om Vajra Guru Padma Siddhi Hum. They chant the mantra four times and offer their benediction. Their task is to purify the sacred space, the objects of worship, the lineage of teachers, as well as the disciples. 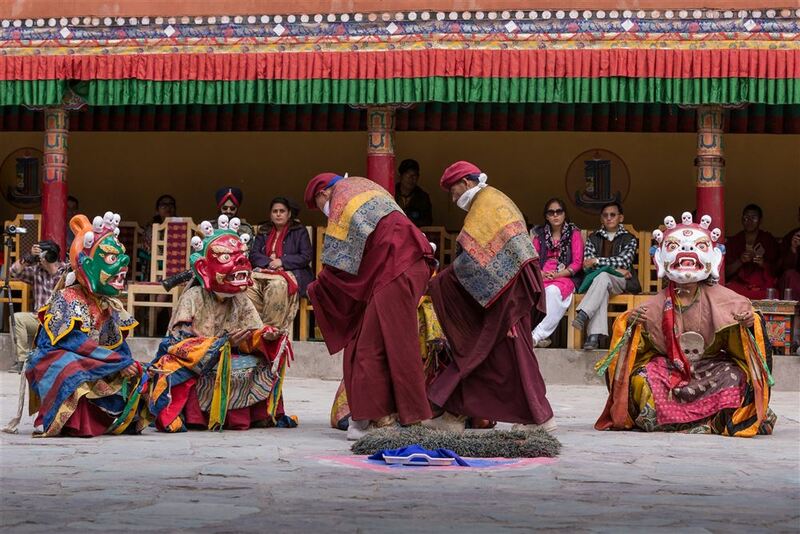 This is the most spectacular aspect of the whole performance, infact, the centre-point of the ritual dance. 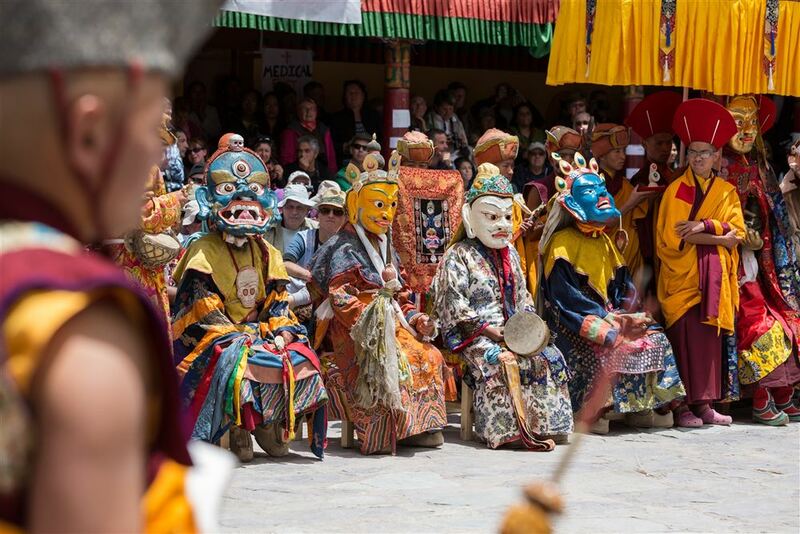 The great guru Padmasambhava, in whose honour the festival is performed makes a dramatic entry with his entourage. The guru wears a golden mask with benign countenance, and a serene Buddha like face found so often in the sculpture of South East Asia. 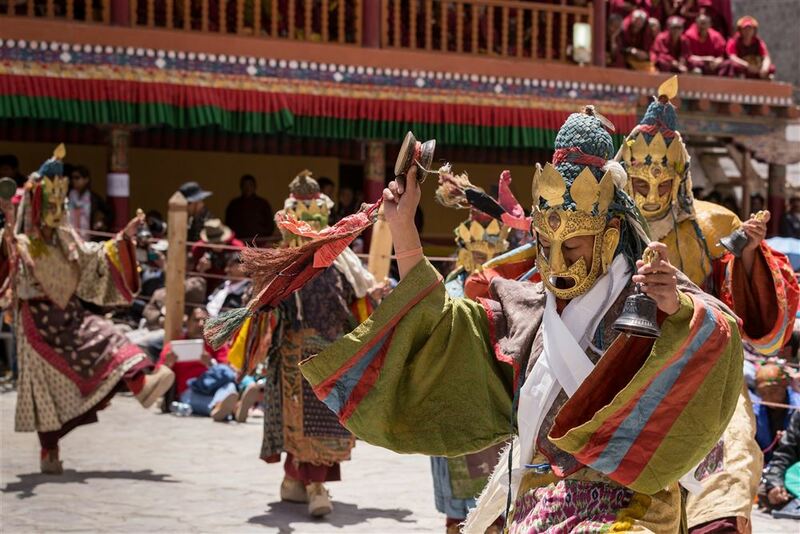 The guru is led by a procession of musicians, some masked and otherwise, to the resounding sounds of music : two lamas hold incense pots (phoks) and two blow wind-pipes (rgya gling), two play long trumpets (dugchen). They enter the arena in rows. 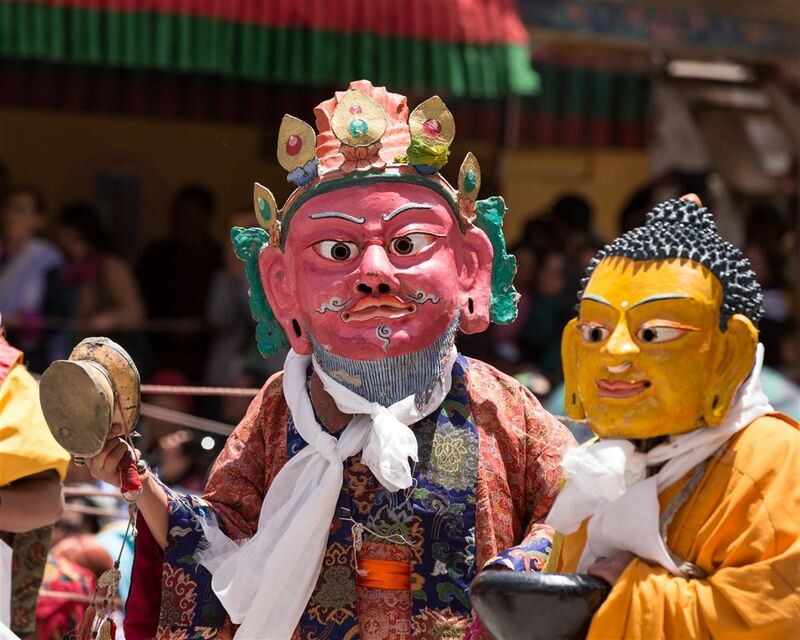 Then follows guru Padmasambhava accompanied by a disciple who carries a parasol for the guru. Padmasambhava is accompanied by his seven more personifications. 7. 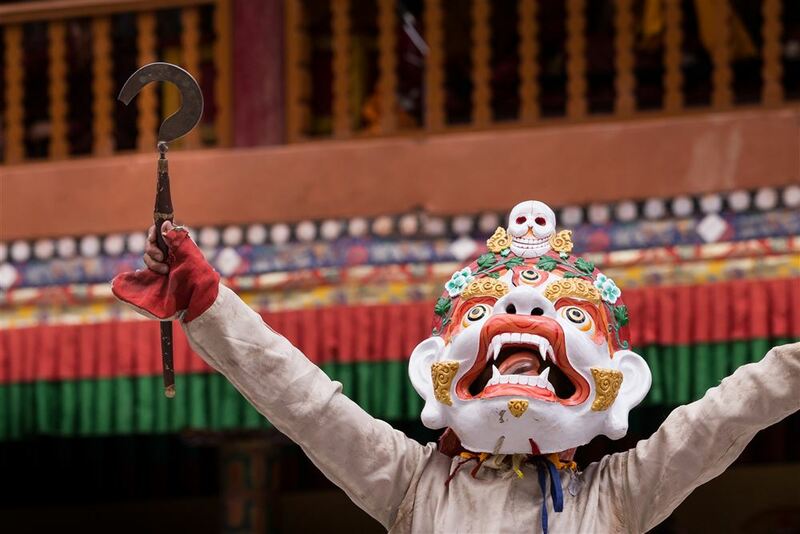 Dorje Tolod Reddish-brown Vajra & Iron Subjugated all the evil spirits of Nepal, Tibet and Bhutan. Revealed the truth for the people. 7. Space where 16 forms of katichan or dakinis sit during the worship of Padmasambhava. All the characters take their respective place in the courtyard (indicated in the diagram). 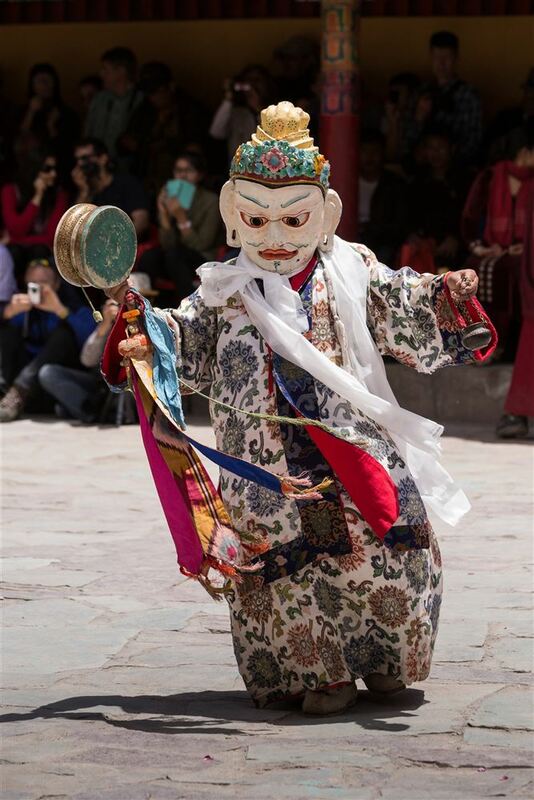 The four masked heroes praise the qualities of body, speech and mind of Padmasambhava and dance before him. 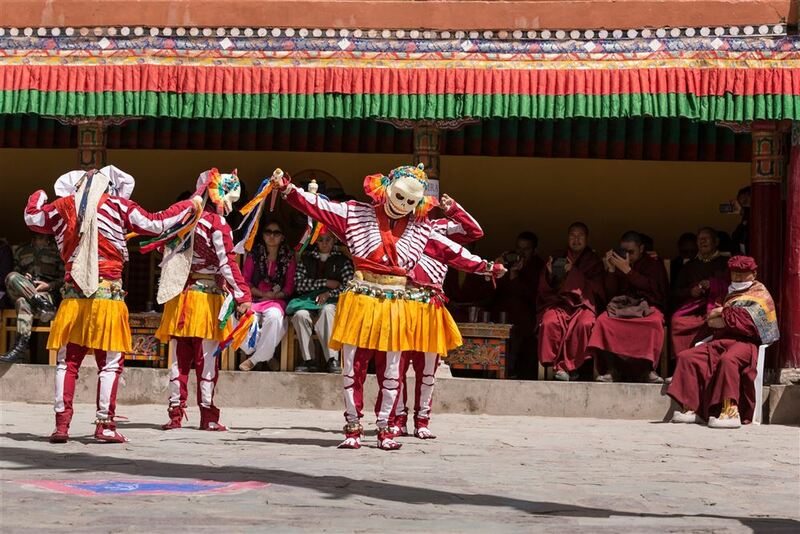 Then the five heroines, who represent the five skandhas, the five senses, the five elements, the universe of five Buddhist categories, dance in front of Padmasambhava and praise the three bodies of the guru. 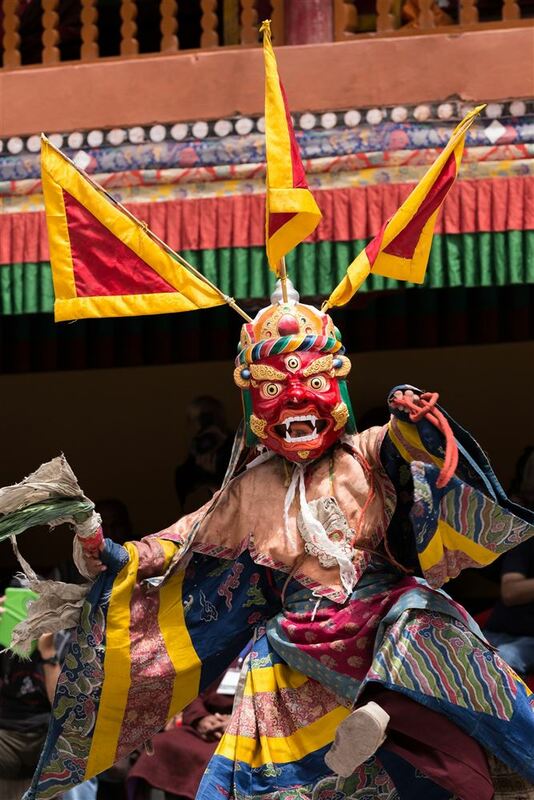 Then each of the incarnations of Padmasambhava wearing masks of different colours, dance one after another and display their majesty and prowess to protect and bless humankind by articulating their qualities by their gestures. A group of sixteen dakinis pay homage to the guru for his kindness and compassion for humankind. They praise him for descending on earth by riding the rays of the sun. They recall his deeds and entreat him to come again in the future. 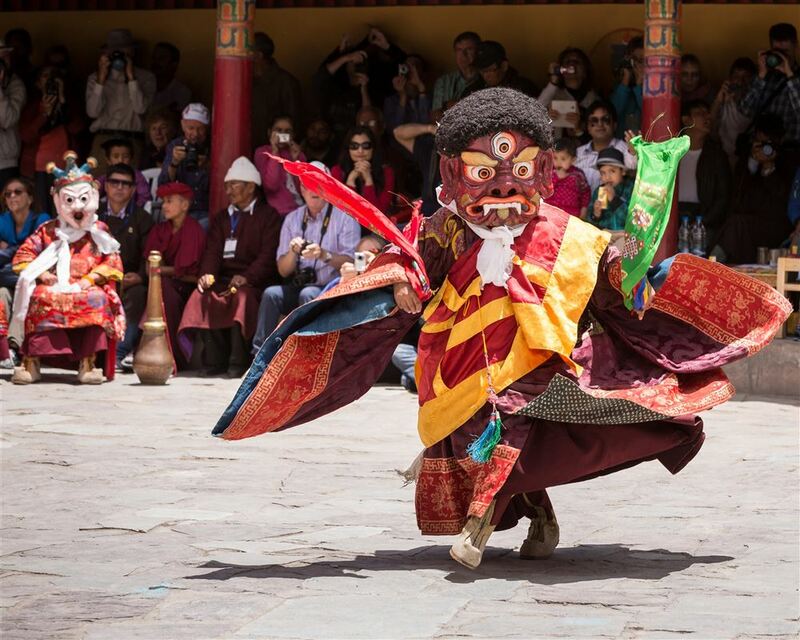 After the guru Padmasambhava is propitiated the second most important part of the performance takes place. 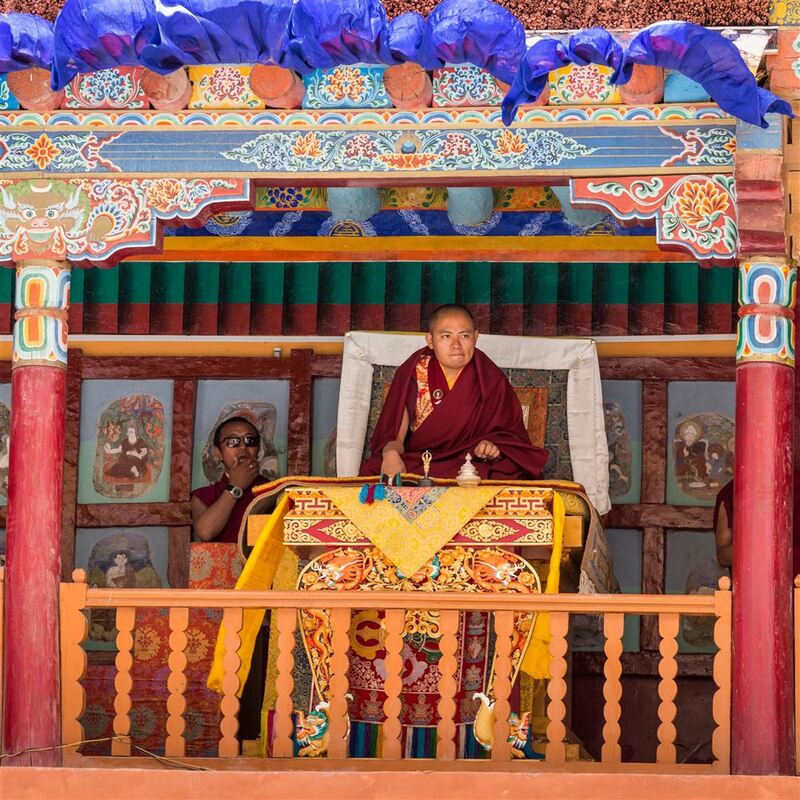 Concerned mainly with the protection of Buddha dharma and banishment of evil, so that Dharma retains its unshakable strength at the face of destructive forces and obstacles that lie in its path. 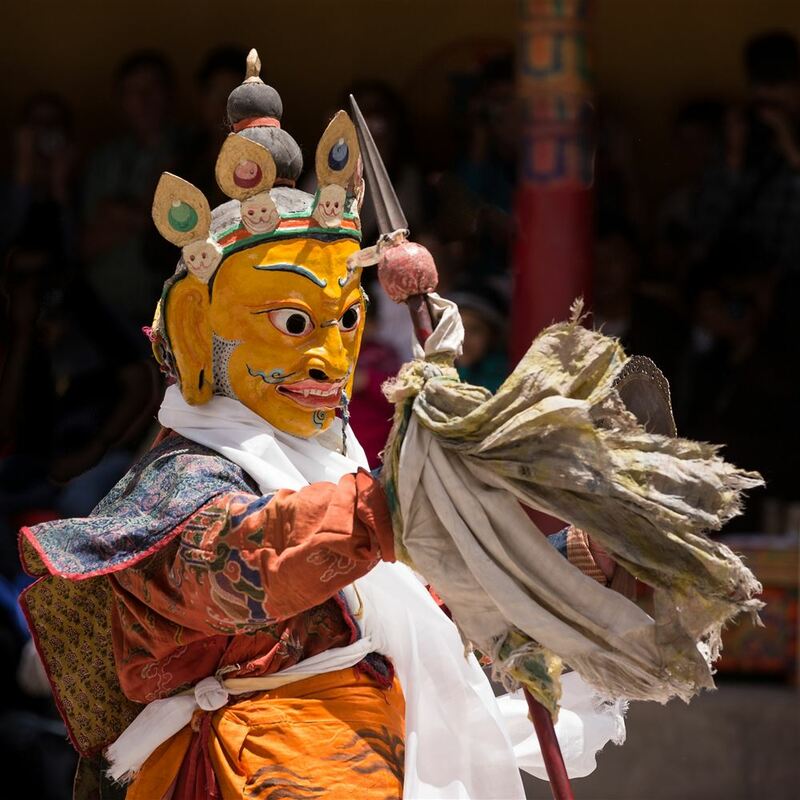 Twelve Dharmapalas who are especially assigned the task to protect the teachings of Buddha now emerge wearing their colourful masks, and holding their respective weapons. 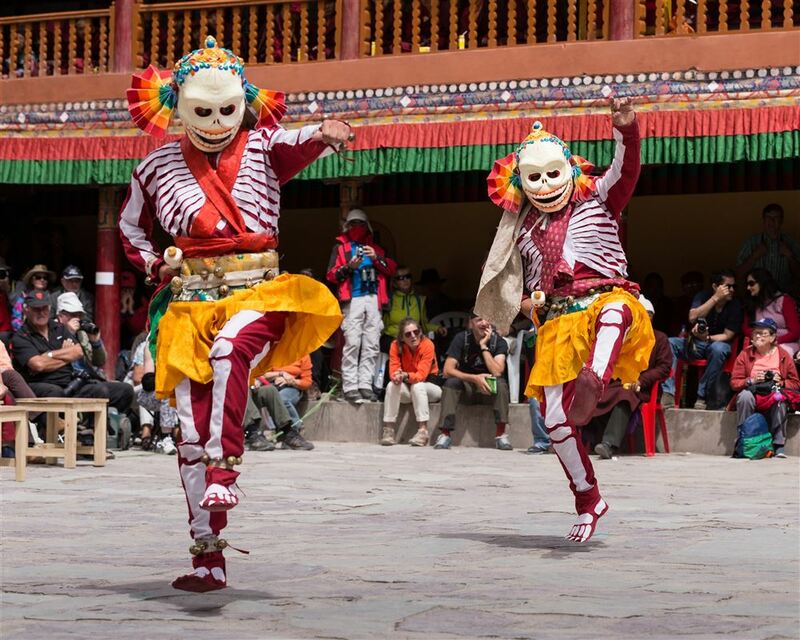 They dance in ecstasy to protect the teachings of Buddha. Four dancers emerge wearing white masks representing graveyard ghouls with sunken cheeks, gaping mouths and protruding fanged teeth. They are the masters of the graveyard. Their task is to locate evil and carry those evil and demonic entities to higher deities who have the power to destroy them. 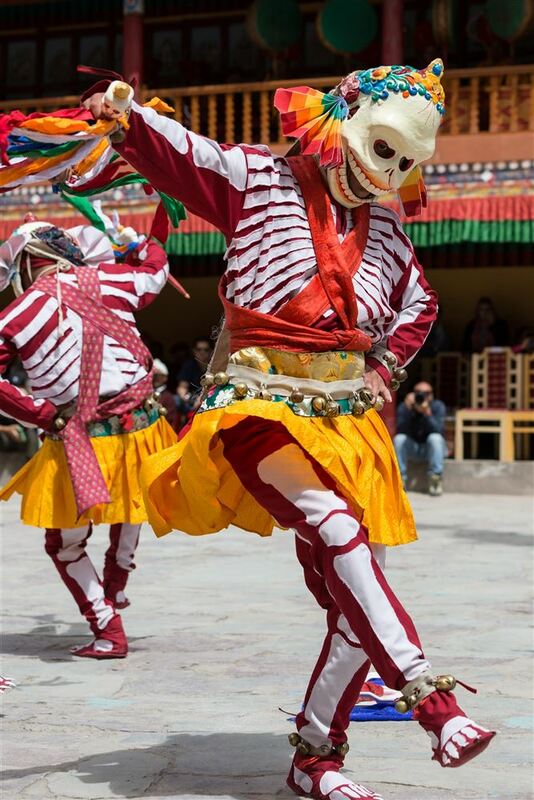 Their bodies are covered with red cloth on which skulls and ribs are depicted by white streaks. Another procession of dancers come down the steps. 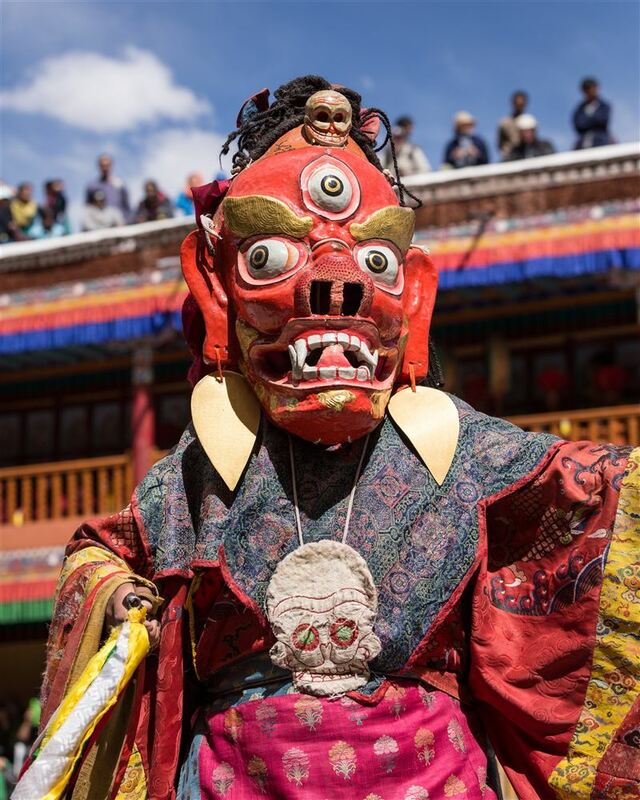 They are the four herukas or the wrathful forms of Buddha. 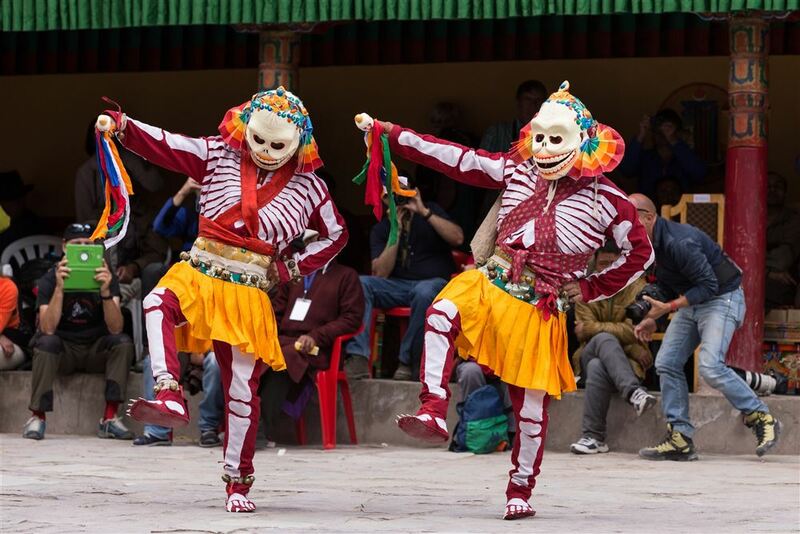 These forms of Buddha dance and put an end to evil. They transform the negative traits of the psyche into pure nectar of enlightenment. 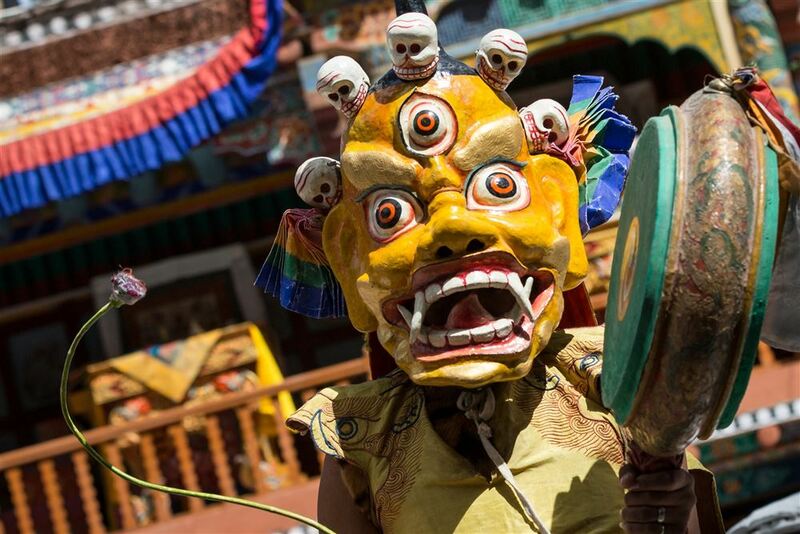 Five dancer-deities enter with grotesque masks, in red, white, yellow, green and brown. 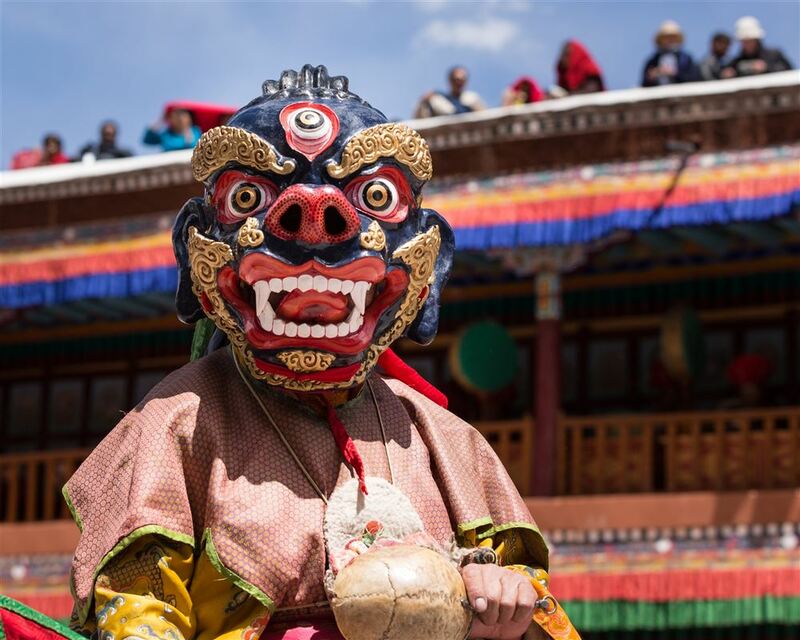 One among them who leads, wears a big devil mask, with curled tongue and tusks. 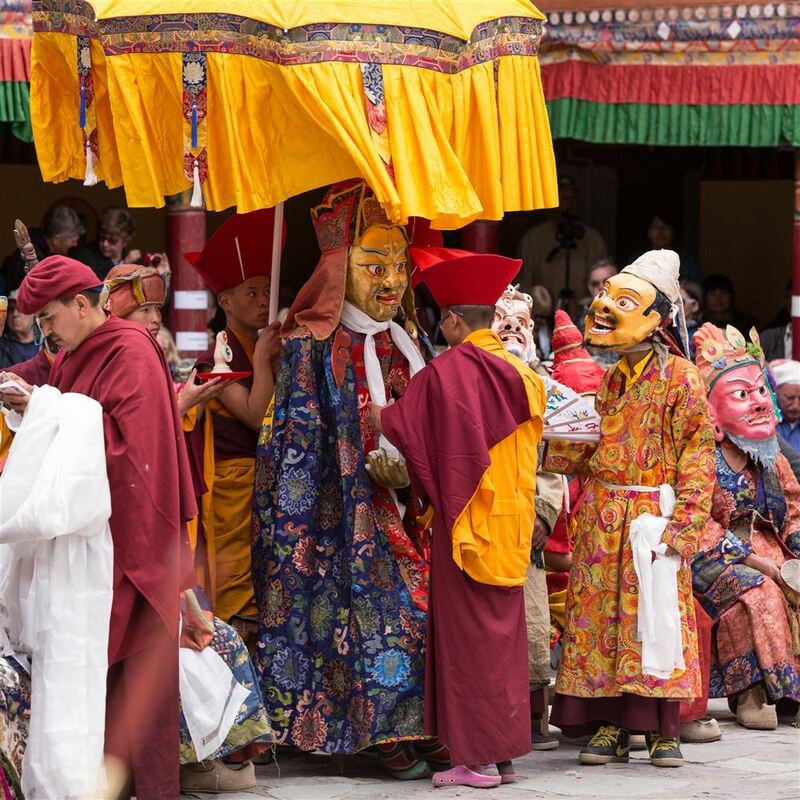 Monks enter and hold out the offering, which is sprinkled, the remainder is placed by the uncovered effigy made of dough. 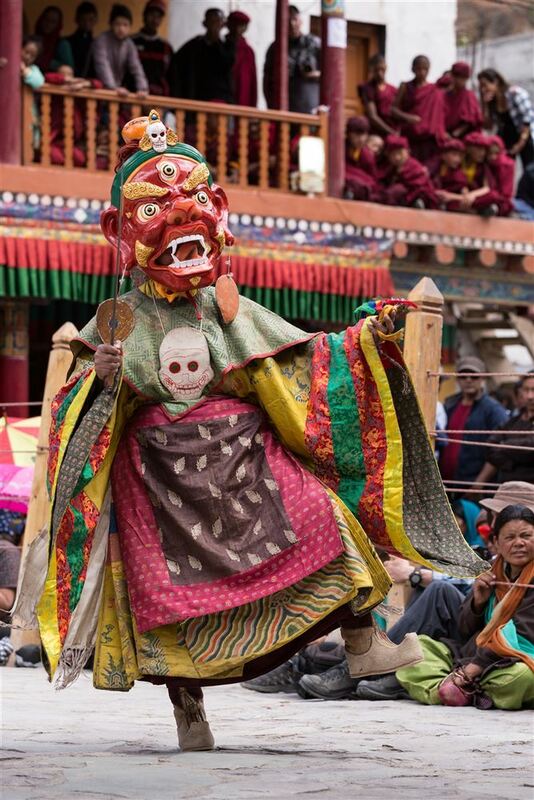 The leader with a demon – mask, approaches the effigy and cuts it into two. This signifies the ultimate death of the evil spirit. The monks remove the remnants of the figure. 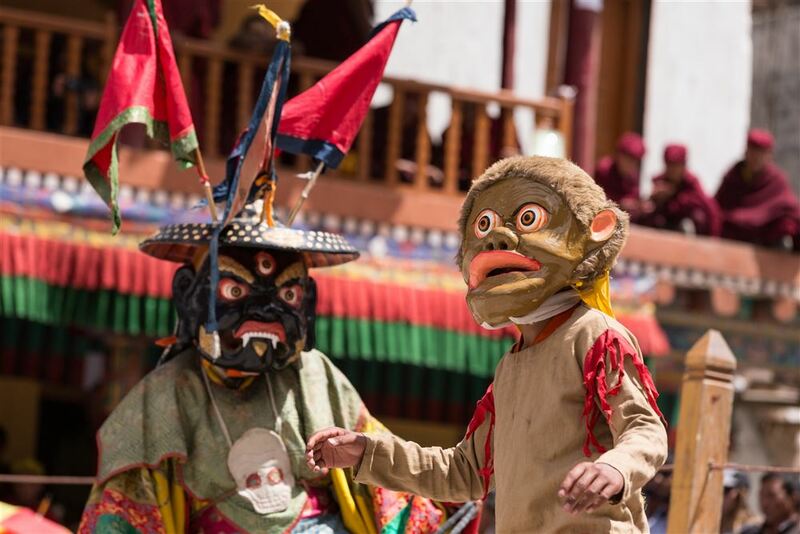 In the final episode of the performance, five heroes, (saking) who belong to the earth and five from the heavens (namking), appear with masks amid the drum beats, demonstrating their triumph at the destruction of the enemy. 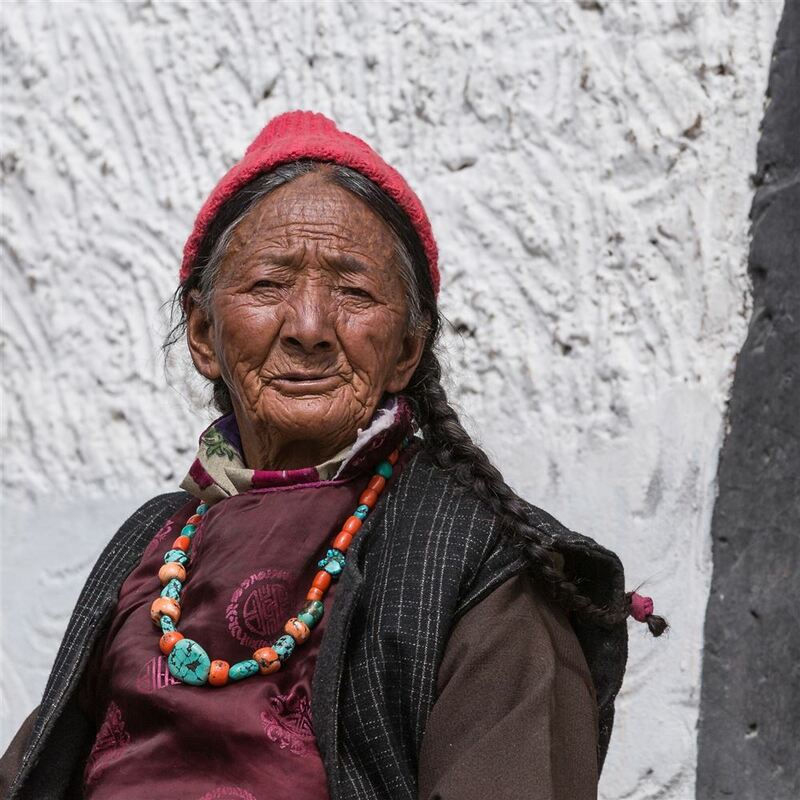 The common people of Ladakh refer to them as the heroes of the sky and earth. 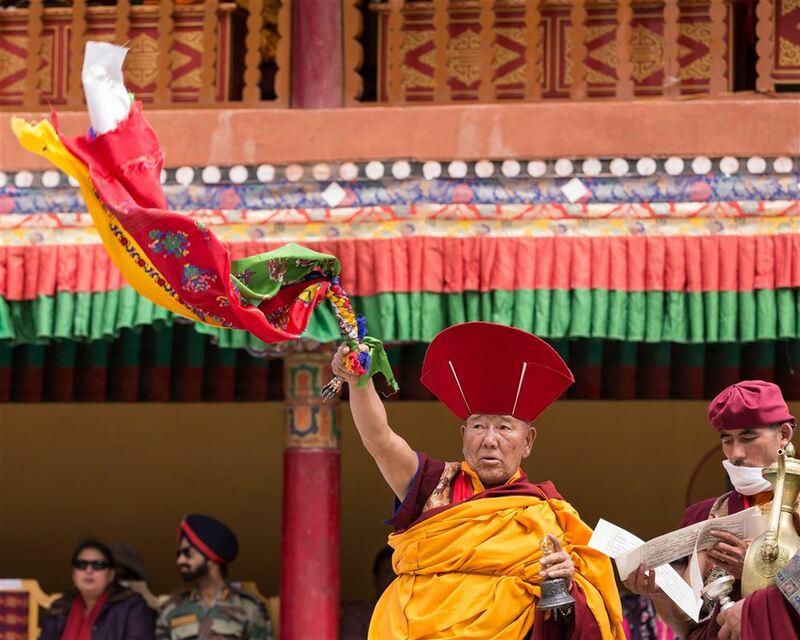 In the final act, the thangka of the guru is rolled back to the resonance of the music. Day 1 of the festival concluded around 3pm, with an hours break for lunch at 1pm. It was a privilege to witness the dances even if at the time I really had no appreciation of what has actually happening. 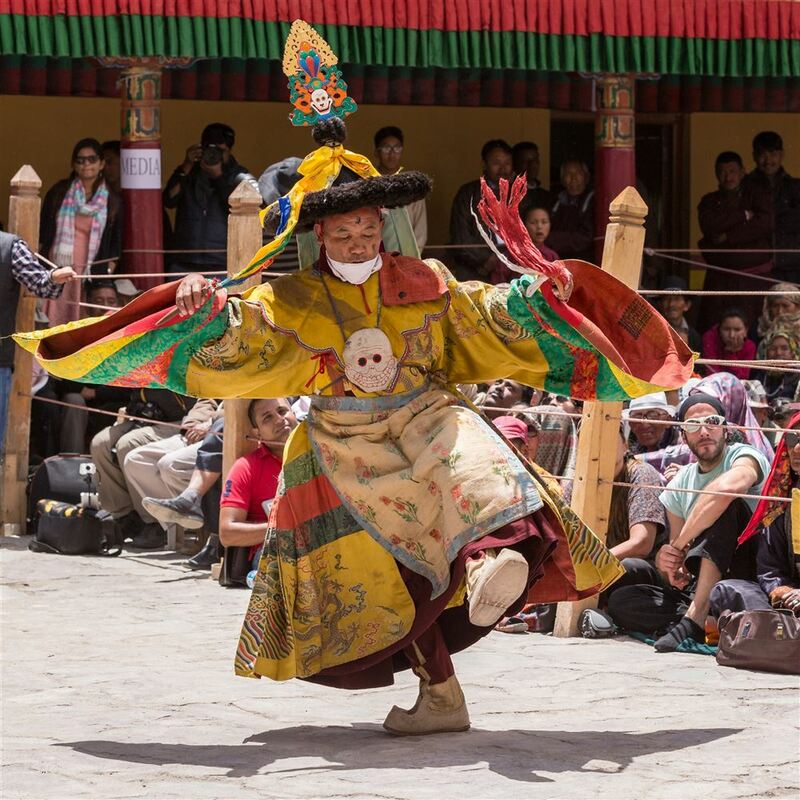 Part of the reason for adding so much content to my blog post about the festival is the hope that in future those wishing to attend the event can at least get a very basic understanding of the meaning to the performances. Click here for an account of day 2 of the festival ! I must credit Indira Ghandi National Centre for the Arts from where I managed to obtain the most useful detail about the dances themselves. That’s one big great post. Thanks…Day 2 of the festival coming up soon…. I’ve just added you on Instagram, would love to see the pics ! 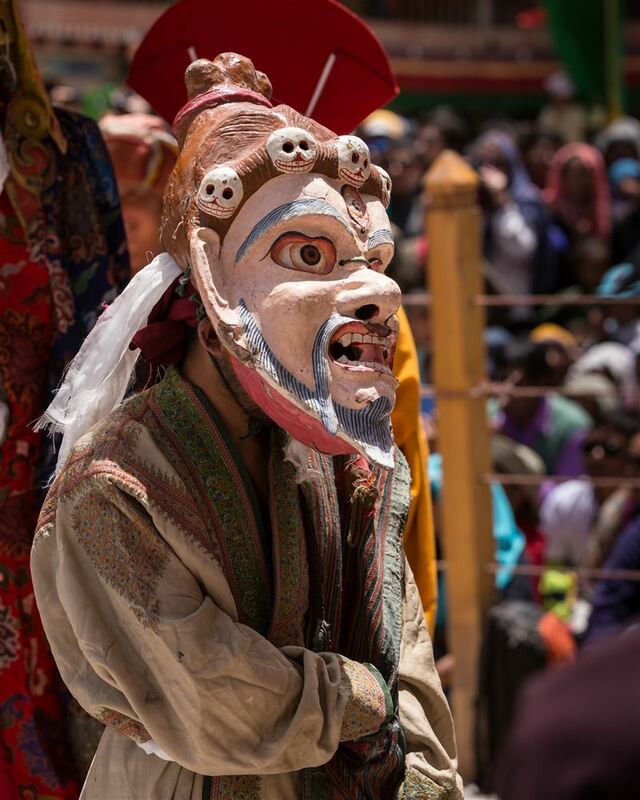 Im currently in McLeod and a little gutted I cannot make it to Ladakh. Best wishes.